"I always say that there should be a President who's a farmer. Farmers deal with diversity all the time. They get it done. They take risks. I believe one would be great as a president." Mushrooms are interesting, curious little vegetables, and we are fascinated by how they're grown and the process involved. We have known To-Jo Mushrooms for over a year now and have been buying them at the grocery stores for some time. We are impressed by their ways of business and how the family continues to operate in a really value-conscious way. We talked to one of the two brothers who owns, runs, and farms mushrooms for To-Jo, and we are excited to share his story here. FOOD: All kinds, but Mexican is my favorite - Italian is a close second. DRINKS: Lots of water, no sodas, and I love Indian Pale Ale beer. THING TO DO AFTER WORK: I love to fish, but I can't do it often, so spending time with my family. MOVIE STARS: Not a huge movie buff, but I love TV's Deadliest Catch and Wicked Tuna. MANTRA: "Treat people like you would like to be treated." I'm a 4th generation farmer, so I’ve always known for as long as I can remember that I wanted to be a mushroom farmer. Never was it a question of what I would do. It’s in my blood. There's nothing else I’d rather do. I’ve always known for as long as I can remember that I wanted to be a mushroom farmer. Never was it a question of what I would do. It’s in my blood. There's nothing else I’d rather do. What do you think a big misconception is about farming? A misconception about mushroom farming is that we grow over a lot of acres. So the common question to ask me is how many acres we have, but since we go in greenhouses, we grow in square footage rather than acres. “Bed space square footage. 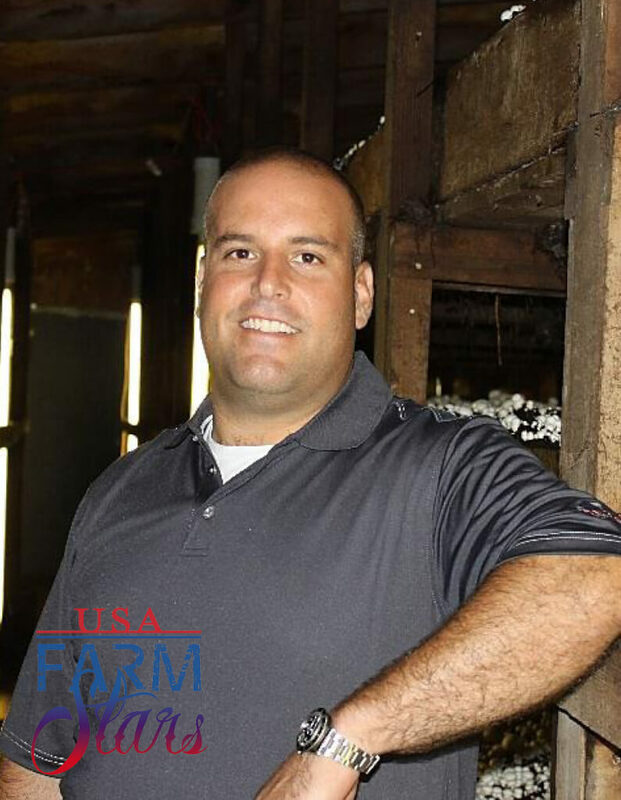 “ As a farmer in general, I’d say that people see farmers as less technologically advanced, more kind of just driving a tractor. I don’t think they realize how many tractors have GPS systems now. And there’s so much science involved in farming, and there’s a lot of hard work, passion that goes into it. I don’t think hard work is a misconception, but I don’t think people realize how much today’s farmer is using tech advancements to farm. “ As a farmer in general, I’d say that people see farmers as less technologically advanced, more kind of just driving a tractor. I don’t think they realize how many tractors have GPS systems now. And there’s so much science involved in farming, and there’s a lot of hard work, passion that goes into it." Yes, a 5 year old daughter and 2 year old twins. Where is the farthest you have traveled? Where would you like to go? Furthest was to Holland, Netherlands. I’d love to go to Italy, that’s where my family is from so I’d like to go see that. I’d also like to go to Costa Rica for good fishing! I don’t let it rule my life, that’s for sure. It’s important but it’s not the thing that should be your #1 focus in your life. It makes things easier, but I don’t feel that it makes you happier. What was the hardest part getting started? Taking over the farm? Probably having people that are sometimes twice my age reporting to me. I mean, more so my own perception about it versus their respecting me, because it was just hard for me to wrap my head around having to tell the people I respect so much what to do. We’re a kind of family here so it was hard to step into that role at first. Being in it for your whole life, are there really any surprises? I would say it seems like as you meet more and more farmers, it’s almost like a fraternity. You instantly connect with other farmers more than with people in other areas of business. I personally relate more to other farmers, it seems. Tell us about a day on the farm - when does your day start and end? It typically starts early because I work out with cross-fit at 5am. Then I am back and out the door by 7am, and then I’m usually home by 6pm. And then several times a week I’ll go back at night from 8:30 – 11pm to check everything and make sure everything is operating right. We have a lot of AC units, so we have to make sure that all of them are running and adjust any that are needed – especially when in the pasteurization phase, and we have to adjust fresh air to those rooms so we go back at night. Make sure there are not power outages, as power outages are always a concern. Seeing happy employees. I oversee all organization’s employees from harvesting to the truck drivers, so seeing them happy is important. It makes me happy. We have about 310 people working with us. I oversee all organization’s employees from harvesting to the truck drivers, so seeing them happy is important. It makes me happy. We have about 310 people working with us. Weather. It can affect our yields so extreme hot weather really seems to affect us, as does real cold weather. That seems to frustrate me. When we do our composting, it’s done outdoors so it’s susceptible to environmental conditions. What’s the best part of a day in mushroom farming? The best part is just being here and being part of a family business. Seeing mushrooms growing and knowing that we’re actually growing something that people consume. And it’s a healthy item, too. It’s a good feeling. What’s the worst part of a day? The idea that there’s never an end to the day. I leave and turn the lights off and say I’m done for the day, but you’re always worried if the a/c went off. Or I get worried that some part of the staff may not show up tomorrow. It’s the fear over whether or not everything is going smoothly. It’s a 24 / 7 operation, when you’re dealing with a growing organism … you can never relax. I think to never be complacent, for sure. We’ll have good crops and we’ll try and repeat exactly what we did, but have a totally different result. Doing the same thing over and over again doesn't necessarily achieve the same results every time. So you can never be complacent! Do you have any advice for fellow farmers? You get out what you put in, there’s no question. You have to work for everything, earn everything; don't rely on anyone ever just giving you something. Anything to say to those who aren’t farmers? Without farmers, there is no food. People complain about odors and noise involved at times with farming, but they don’t realize that we’re making food. I just want people to remember that without farmers, there is no food. Where do you think you’ll be in 5 or 10 years? We’ll be here, bigger, better, stronger and more technologically advanced, for sure.